Does Metro Vancouver need a theatre project that rings an alarm bell about homelessness? Absolutely not. What after homelessness… can, and should do, is create a vehicle for people living the issues to help develop policy and plans to ensure that housing that is created is safe, appropriately supported and affordable. It is well beyond time that we started building affordable housing aimed at the homelessness situation in Metro Vancouver and beyond. To say the situation is urgent is an understatement. Contributing to this situation, over 50% of households in the City of Vancouver rent their housing, as do 33% in the Metro Region. Evictions from rental accommodation for cosmetic renovations are on the rise as real estate prices continue to skyrocket. Canada Mortgage and Housing Corporation (CMHC) considers vacancy rates for bachelor units in the West End, for instance, which contains 25,285 tenant households (5% of the rental stock in all of BC) to be zero. ² Also, despite recent rooming house purchases by the Province of BC, rooms in the Downtown Eastside of Vancouver continue to disappear in the build-up to the 2010 Olympics. Homelessness in cities surrounding Vancouver (Surrey, Abbotsford, New Westminster, etc.) are all on the rise. Homeless numbers rose in every municipality in the March, 2008 Homeless Count. It gets worse: One in seven users of emergency shelters across Canada are children, with almost a third of the homeless ranging in age from 16-24. An estimated 25-50% of homeless people have a mental illness.³ Aboriginal people represent over one third of shelter users - even though only 1.9% of the population of Metro Vancouver is Aboriginal, according to the 2006 Census. The report, "Housing and Support for Adults with Severe Addictions and/or Mental Illness in British Columbia", commissioned by the BC Health Ministry, estimates 8,000 to 15,500 adults in the province with severe addictions or mental illness are homeless and almost 40,000 are inadequately housed. How has this happened? Of course the answers to this question are both complex and simple. It is easy to understand how being homeless would be bad for one's mental health. It is also important to note, however, that starting in the 1980s various Governments started deinstitutionalizing the mentally ill. The federal cost sharing for a national housing program was ended in 1993 with only three provinces continuing to maintain their provincial housing programs. In BC, welfare rates were chopped in 2002 which had a direct impact on the level of street homelessness - short term cost savings for which we are still paying. "We have turned the streets and the prisons into the asylums of the 21st century"
Mr. Kirby spoke these words from the stage at the Collaboration for Change Public Forum on April 28, 2008. It was at this packed event that he also spoke about how building housing without adequate social infrastructures surrounding that housing was not going to be good enough. It was at this event that I understood how Headlines Theatre could ring more than an alarm bell; that we could contribute positively to the creation of safe and affordable housing. What can a theatre company do? I need to speak very personally here, as someone who, like many, has found a way to "normalize" the people going through the garbage in dumpsters behind both Headlines' office and my home. Why have I done this? Inside me, I have the need to self-protect somehow. Otherwise I get too angry; too hurt; too embarrassed; too fearful. The creation of 'the other' makes me feel more safe. And yet, I know very well that if I saw my sister (my real life sister) in the dumpster behind Headlines Theatre's office, that I could not, under any circumstances, keep walking to my car. I would have to act. The theatre can take statistics and transform them into personal stories; the theatre can be a true voice of people who are struggling with various aspects of the homelessness issue; the theatre can open up the irony of the creation of 'the other' in a world where in fact there is only 'us' and in doing so, re-personalize 'the other'. Headlines has a 27 year, multi-award-winning history of creating this kind of theatre. 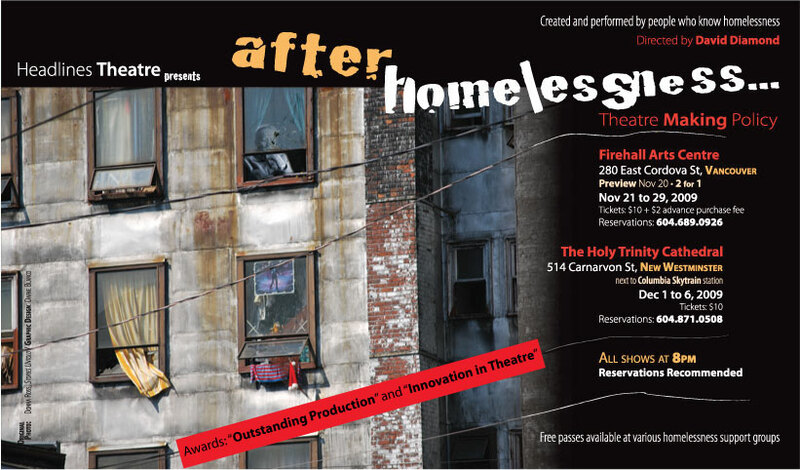 More than that, this production, created and performed by people who have struggled with homelessness, (and attached to that, mental health issues) can create a vehicle to help develop policy and plans for Government and social service agencies to ensure that housing, when created, is safe, appropriate and affordable. Forum Theatre is an opportunity for creative, community-based dialogue. The theatre is created and performed by community members who are living the issues under investigation. Over the course of a six day Theatre for Living workshop, participants engage in very specific games and exercises that help them investigate issues at a deep level. In a mainstage production such as this one, after the workshop, the cast, production team and I then have 3 weeks to make the best art we can, that tells the truths that have risen out of the workshop process. When I say "tells the truth", I mean as true questions - hard questions - the questions for which we don't have clear or easy answers. The resulting play is performed once, all the way through, so the audience can see the situation and the problems presented. The story builds to a crisis and stops there, offering no solutions. The play is then run again, with audience members able to "freeze" the action at any point where they see a character engaged in a struggle. An audience member yells "stop! ", comes into the playing area, replaces the character s/he sees struggling with the problem, and tries out his/her idea. We call this an "intervention". The process is fun, profound, entertaining and full of surprises and learning. Headlines' Theatre for Living workshops have evolved from Augusto Boal's "Theatre of the Oppressed". Since 1989 Headlines' work has slowly moved away from the binary language and model of "oppressor/oppressed" and now approaches community-based cultural work from a systems-based perspective; understanding that a community is a complexly integrated, living organism. "I saw Here and Now (gang violence issues) on Thursday night and stepped in for a character. It was an amazing experience. This was my first exposure to forum theatre and it is incredibly powerful. It really gave me a greater perspective on the issue of gangs and the individual struggles that encompass it. And what is so cool, is that this form allows, and even forces, the audience to think about it, struggle with it and explore problem solving. It is very empowering to be reminded that we all have choices." "Thank you for a thought provoking, engaging performance. Practicing Democracy (chronic poverty issues) is theatre one does not walk away from but propels one to think about what I can do to help make our community inclusive and friendly." How is Legislative Theatre different from other Forum Theatre events? We will engage a housing expert as Community Scribe for the project. At the Forum Theatre events it will be the Community Scribe's job to document the interventions, collate them, study them, and translate the desires at the core of the actions into policy language to be presented as a Community Action Report for the creation or revision of safe and appropriate housing policy and housing construction. This person will need to have a working knowledge of policy around these issues. Headlines has agreement from the Mental Health Commission of Canada and the Greater Vancouver Regional Steering Committee on Homelessness to use the Theatre for Living process and the Community Action Report as a part of their research for National and Regional strategies on mental health and homelessness. (The question arises about funding from either agency. It is best for the project if the neither of the agencies contribute funds. This would make it a "fee for service" situation and compromise the arms length aspect of the input, and therefore the integrity of the project). In 2004 Headlines collaborated with the City of Vancouver on an experiment in Legislative Theatre called Practicing Democracy. After a unanimous vote by the City Council of the day, we worked with people who were living issues of chronic poverty and created a main stage Forum Theatre project that asked questions about how the City could respond to cyclical issues of poverty in the Downtown East Side and beyond. Through the audience interactive events, ideas were gathered from the public, for civic policy initiatives to address issues of health, housing, food, advocacy, etc. Practicing Democracy was a way for citizens to use the theatre to communicate with Government. Over 90 recommendations went forward to the City from the theatre project. Please see http://www.headlinestheatre.com/past_work/pd/finalreports/index.html for the full report (scroll to the bottom of the page), prepared by Carrie Gallant, B.A., LL. B. "Headlines Theatre's Practicing Democracy makes for riveting theatre." "Practicing Democracy provided its audiences and workshop participants with lived experience of democratic process linked to fierce, compassionate art practice, and that's the sort of experience that can be habit forming. Once again this courageous theatre company has expanded the boundaries of what we can expect from theatre and from our political masters. Headlines Theatre continues to be one of the nation's hidden cultural treasures. "...the benefits of using actors who really do know a thing or two about living in poverty become strikingly clear. These are simple truths, bluntly told, but grippingly poignant. While the reasons behind Practicing Democracy are deeply political, the project still manages to maintain a very high entertainment value." "Few plays (Here and Now) offer such an opportunity for collective understanding, and such a powerful catalyst for change." "The Here and Now project holds a great deal of value within our local community and within our larger global community. As a member of the local Indo-Canadian community, to introduce this production with a discussion on the politics of race was valuable. By illustrating this point with an example of the non-racial identification of a 'white'/'Caucasian' gang like the Hell's Angels - it does hit home with individuals that have never considered the racial profiling conducted by the media. And the exercise of interrupting the play and re-placing one of the performers and performing the "choice" was extremely useful. Many of us can sit back and judge what needs to be done but by performing the actions - you become involved in not only critical evaluation but the common sense factor. I think this project was highly effective and positive on multiple levels. I came with my mother, brother and partner. Sitting within the family context was important to me as many of the issues were mirrored in our lives. As much as that exact story doesn't live out in my reality - it is far too close of a possibility in my world. I think it is important to see how something may play out. Personally, I found mirrors for all of us - and perhaps not embedded within one specific character but with certain mental constructions or characteristics. It is so easy for many of us to stand back and say call the cops - but it isn't as easy as that. There are so many strings that are interwoven and if you tug one - it impacts all of the rest - there isn't one all mighty fix all. Thank you for allowing us, as a family, to view this." Practicing Democracy got completely bogged down at Vancouver City Hall. Some of this was outside of Headlines' control, as the Council of the day imploded on itself, split, and led to the current division between the two Civic parties, COPE and Vision Vancouver. Some of the difficulty, though, also stemmed from our (Carrie Gallant's and my) reluctance to edit the resulting document too deeply. We did not feel it was our place to decide which proposals made it into the document and which ones did not. We anticipated that one or more City Councilors, having voted unanimously to do so, would take on that task. They did not. When they didn't, Carrie and I should have "bit the bullet" and done the job ourselves. Instead, we submitted a document containing over 90 recommendations, which went to City Staff, who tried valiantly to process them all, without the help of Council. With after homelessness… part of the process of the Community Scribe would be to distil whatever suggestions come from audiences into a digestible number of proposals. Because the actual content of a project like this must come from the workshop participants who are living the issues, it is impossible to be absolutely specific about what exactly will be addressed in the play, but we can be certain that the story will somehow deal with homelessness and how it intertwines with mental health - and how the complexity of these issues require well thought out housing solutions. Homelessness will be approached as a community health issue. I think it is possible (this will, however, depend of the working group) that the play could create a world in which housing has been developed, but done badly. The interactive Forum Theatre event could then invite audiences to input ideas for philosophical approaches and structures that would solve the problems presented. This would create a direct route to investigating what makes housing "safe". We at Headlines know from years of experience that this project can and will function as a true voice of people who have themselves struggled with the issues. Because the play creators carry this expertise the play will certainly help communities, agencies and Governments seeking grassroots input into both the social and the structural aspects of the issue. The workshop participants and cast will be drawn from a diverse range of people who have experienced homelessness in the past and/or the present; also people who work with the homeless and people whose loved ones have been or are homeless. Having a living knowledge of the issue will be one of the essential criteria for participation. Any participant who is homeless will have to be found (at least temporary) safe housing. It will also be understood that while wonderful transformations often occur for individuals who engage in this work, and this project will be no different, being in the project is not a healing opportunity - it is employment in a project the purpose of which is to create an artistic focal point for community discussion and transformation. A project like this generates a "buzz" in the media, in the public realm and at very grassroots levels. How do we use the buzz effectively? We want to hold what we are calling a "mini-conference" during the second week of the Vancouver run of the play. This would entail daytime workshops and, perhaps adjacent events on issues of both homelessness and mental health and, of course, their intersections. Speakers and workshop facilitators would be gathered from the local community. The discussions from the workshops would be another way to engage the public and for the Community Scribe to gather input for the Legislative Theatre report that would go to agencies and government involved in the homelessness and mental health issues. The homelessness issue does not confine itself to any one cultural sector of society. Both the workshop group and the cast will reflect the diversity of the issue. It also seems to us at Headlines that the project presents an opportunity for communities throughout the cultural spectrum in Vancouver to come together, and to work together on a shared problem. Headlines has been very successful for many years at drawing out a broadly diverse audience. The audience's engagement in the Forum Theatre process will build cross-cultural understanding and also help investigate solutions to the issues that are relevant to all audience members, in the communities in which they reside. We are in early stages of developing the networks that will support after homelessness… Headlines' community-based working methods dictate to us that strong and broad-based community support and engagement is what helps create the success of our work. In 2006, Meth, our production on addiction, involved 58 Lower Mainland organizations directly in outreach and networking. The production then went on to tour into 28 communities throughout BC. In 2008, it is touring into 31 communities throughout BC, AB and SK (Meth has been renamed Shattering for the 2008 tour). Each community represents a coalition of local organizations working together to bring the production into the community. In 2005 Here and Now, our production on gang violence, was a broad-based collaboration. The outreach network included over 70 organizations and individuals, as detailed in Dafne Blanco's and Manjot Bains' Outreach Reports (the final reports are available here), This does not include the over 30 people who were directly employed by the project, the majority of them being community members. Our 2003 production, Practicing Democracy generated about the same level of organizational involvement (the final reports are available here). Because of the way in which Headlines works in community, after homelessness… will stimulate at least the same level of community involvement as these previous projects. In October 2009, we will gather a group of 20 participants together who are living the issues. Prior to the start of the workshop, we will interview all the participants and from those interviews, decide on a cast that is representative of the diversity of the issue. The reason to do this is so that the workshop itself is not an audition. It is important that each person coming into the process knows what their involvement and time commitment will be. All 20 workshop participants will be paid to participate in a week long Theatre for Living workshop, out of which will come the core material for the Forum Theatre play. Those that need housing will be found housing for one week before until weeks after the end of their involvement in the project. Using theatre games and exercises we will explore how the issues affect the lives of the participants. We will, at that point, be investigating the problems they face, and the "holes" in services around housing that would make housing safe and appropriate. ("Safe and appropriate" includes being supported by appropriate addictions, mental health and other programs). It is these points of tension that will form the subject matter of the play. Using the workshop as the material from which the performance grows, the cast, a professional production team of designers and I, will then have 3 weeks to create an artistic production for presentation to the public. This is the same creation model as was used in Meth (2006), Here and Now, (2005) and Practicing Democracy (2004), and many other mainstage plays. The Forum events will ask the audience to engage in concrete solution investigation to the safe, appropriate housing issue. We have confirmed the Firehall Arts Centre, in Vancouver's Downtown Eastside, for the Vancouver run, Nov 20 to 29, 2009 and for the Community Dialogue Sessions, Nov 24, 25 and 26. The Holy Trinity Cathedral in New Westminster will host 6 performances from Dec 1 to 6, 2009. We will also tour to one Metro Centre outside Vancouver. In order to reach a core audience that is representative of the issues, it is our intention to tour this production into a community hall or theatre outside Vancouver, rather than ask audiences to travel exclusively to a Vancouver location. Community organizations involved in the issues under discussion will work with Headlines' Staff to promote the theatre events in their communities. We are anticipating nine or ten performances at the Firehall and then five performances outside Vancouver, details TBA. Because while the finances to build affordable housing will come from Governments and developers, the knowledge of what will make that housing "safe and appropriate" can only come from those people who have life knowledge of the issues. This project is an opportunity for people who are living the issues to articulate a story that will be a community focal point for making sure that housing that is built, has appropriate supports. This is a new and creative model that attempts to involve the public in real dialogue, that can lead to actual public input into policy and development planning.